Things only I can do. Tasks I like but others could do. Things I hate/shouldn’t be doing. If you’re confused and worried about adding clinicians to your practice, then I think you’re really going to like today’s training. 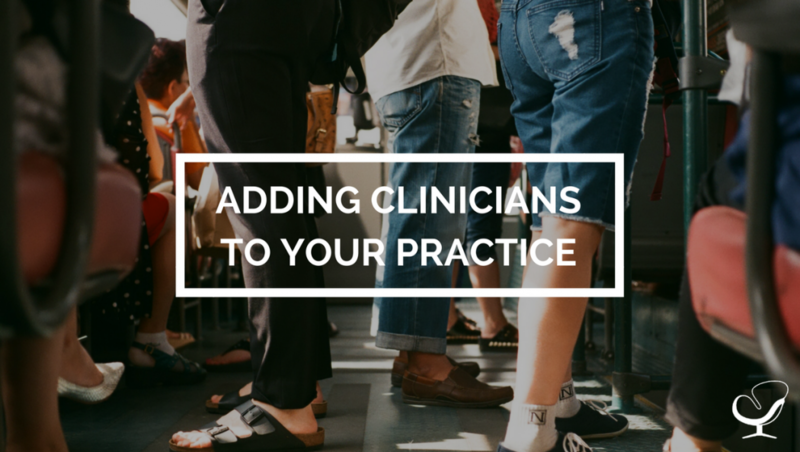 Today, we’re going to talk all about adding clinicians to your practice. At the end, your action is probably one of the best you can take to grow quickly and save time! First, there are two major ways to do it: 1099 and W-2. A 1099 is a contractor. They are independent from you, can make their own schedule (based on office availability), and wear what they want. As the owner, you can be more hands off and act more like a colleague, than a boss. It’s what I prefer, but every state is different. So, make sure you talk with a local accountant or lawyer. The clinician has an incentive to build their caseload, and you don’t feel like you’re wasting your money when there are slow weeks. If the clinician is out of town, they have the benefit of not worrying about rent, and you don’t have to pay them. You can sometimes have more income, depending on the way it is structured. But, your expenses will not go up much, renting her/him space will be the same, so post $28,800 you may only have 10% in expenses. So, to make up the $6,800 ($34,800-$28,800) you would for her to bring in $6,800 x 2 (because of her 50%) + 10% $1,360 = $14,960. Divide that by 48 weeks and that would be $311.44 more per week. 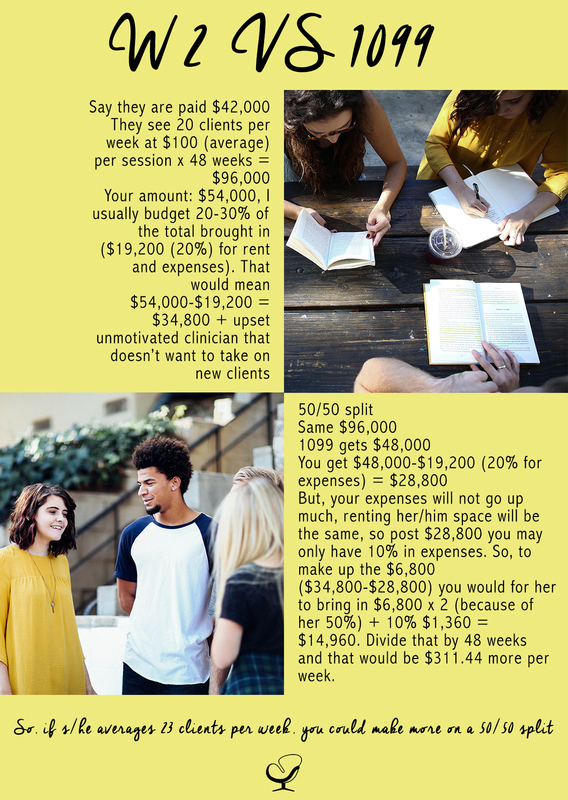 So, if s/he averages 23 clients per week, you could make more on a 50/50 split, does that make sense? Type of Relationship: Are there written contracts or employee type benefits (i.e. : pension plan, insurance, vacation pay, etc.)? Will the relationship continue and is the work performed a key aspect of the business? By having supervision be something s/he has to pay for, it pulls the relationship apart so that it does not appear to the IRS that you tell her how to be a 1099 contractor. 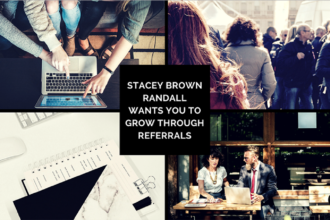 I have a supervision group where I charge $100 (discounted from my session rate of $150) for individual supervision, $70 per person for groups of two to three, and $55 for a group of four. When leveling up the practice, most counselors will not consult an attorney, but will whip together a contract, and wonder if they did it right. Imagine knowing that you’re using forms reviewed by an attorney, that you can change for your state, and know that they were done right! My paperwork packet includes all of my 1099 contracts for clinicians, assistants, and intake, progress notes, and private pay receipts. Click here to get the paperwork packet. ACTION: Download the Paperwork Packet to start leveling up your practice. I’d pay a local attorney to review it for your state to have additional peace of mind. Most people say it takes about 15-30 minutes for them to review it, compared to the two to three hours to write one up! If you’re adding W-2s, listen to this podcast from a clinician that added W-2s. Next, we’re going to talk all about how to stay focused on big goals.